I went to the forums at www.beesource.com as well as our club's online bulletin board for new beekeepers, and got the word. It's robbing, and it has got to be stopped. The principle behind the screen is simple: robber bees are attracted to the scent of the colony they wish to rob, though they aren't oriented to it. By moving the entrance 6 inches up, but allowing the scent to issue from the same place, the robbers will keep bonking away at the screen until they give up. The inside worker bees, however, will eventually figure it out as they orient themselves when they emerge, and when the field bees finally stumble in the right place. If you look at the picture top left, you see what looks alot like a bad picture frame holding hardware cloth with openings too small for a bee to pass through. 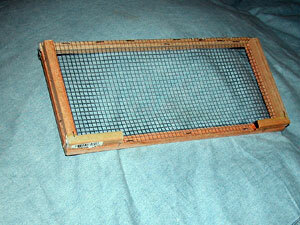 On the inside (facing the hive) top and bottom edges, however, the frame is missing (or has openings). 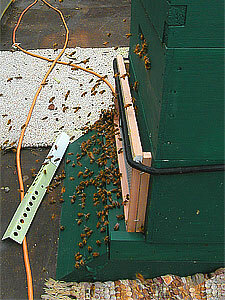 When that side is held up against the front of the colony, the bees can descend though the opening at top and enter the hive through the one on the bottom. My screen is not the same as the model, because I do not have real woodworking tools: instead, a mini-mitre box worked to cut already-milled 1/2" dowels, and some wire snips managed to cut a piece of 1/4" hardware cloth to size. My staple gun tacked it all together. The black rope in the photo on the right is actually one of my extensive collection of bungee cords. I had to squash some bees to install it, and this felt just horrible. The bees — many of them carrying pollen — became totally confused and just ran all around after I installed. This was good, in that robber bees do not bring pollen to hives: meaning that the bees at the entrance were no longer robbers. Also good: apparently our pollen situation is good even though nectar is bad. JonM, the beekeeper who helped me, says that the real field bees will work out how to enter eventually, while the frenzied robbers never will.